Equine Metabolic Syndrome & Laminits: What's the Connection? Now that we have discussed the role that energy metabolism plays in Equine Metabolic Syndrome , let's take the next step in understanding this potentially devastating condition. 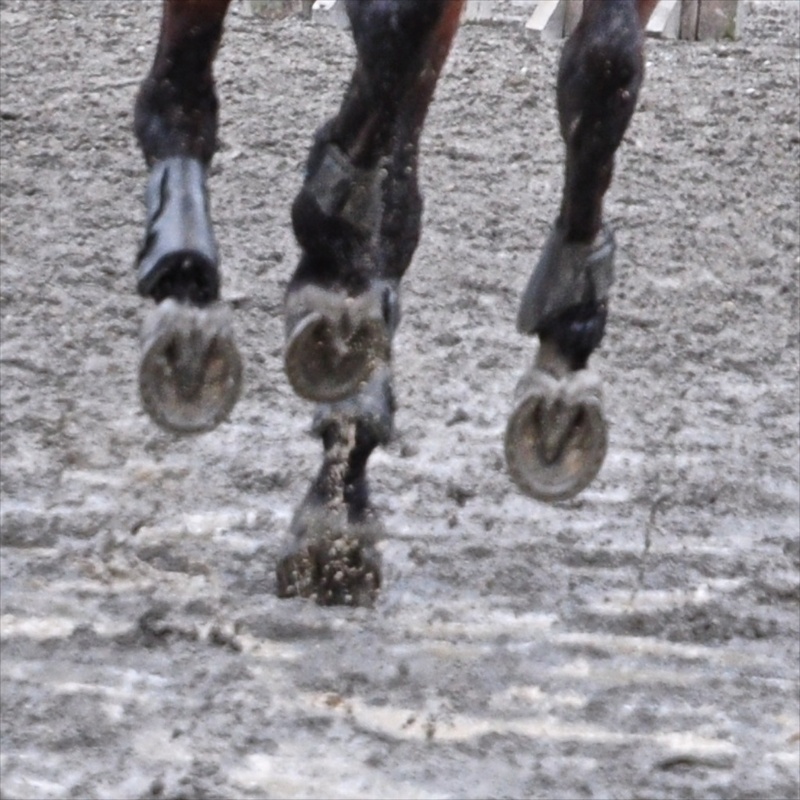 Many of you out there with Equine Metabolic Syndrome horses are doing battle with laminitis. Laminitis, commonly called founder, is an inflammatory condition of the horse's foot. The outer hoof wall is connected to the deeper, sensitive tissues of the foot by layers of interdigitating tissue. Picture it in your mind as a tongue and groove floor, where each layer interlocks like repeating pieces of a puzzle. 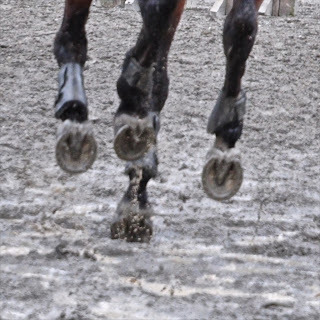 Unlike a floor or a puzzle, the horse's foot is alive and in motion. Weight bearing and athletic activity are constantly stressing the bonds between the interlocking hoof layers. The horse remodels and repairs these bonds as part of the body's daily work. Just like any other job, this maintenance work requires ENERGY. The hoof utilizes glucose at an exceptionally fast rate compared to other tissues. At this point if your brain is saying, "hey, this sounds familiar - didn't the last blog say that Equine Metabolic Syndrome had something to do with energy, glucose, and insulin?" then you are right! Horses with EMS do not respond normally to insulin, they are "insulin resistant"
Horses with EMS have high resting insulin levels and respond to sudden increases in blood sugar with abnormal insulin responses. For the foot to remain healthy, glucose must be able to reach the tissues cementing the hoof layers together. Anything that disrupts the blood supply, or interferes with the complex cellular mechanism of energy metabolism, puts the normal foot at risk. When horses with EMS consume high carbohydrate meals, their already high blood insulin increases even more, thereby increasing their risk of laminitis. And thus the circle closes: energy/insulin/hoof tissue metabolism/carbohydrate intake. All are interconnected in an incredibly complicated process that leads to painful, inflamed feet that are very difficult to resolve, despite good management and veterinary care. And now we begin to understand why these cases occur at certain times of year. In mid-winter, when an EMS horse is inactive, and an owner increases energy intake thinking that this will combat the effects of severe cold. Or in the spring, when seasonal hormonal changes put affected horses at risk, and spring pasture becomes available. Horses with Equine Metabolic Syndrome without laminitis have been described as "prelaminitic metabolic syndrome". Insulin levels in such animals have been measured at twice normal blood concentrations when grazing winter pastures. In the spring, when lush pasture was available, the same animals developed laminitis and had even greater insulin concentrations. In our next segment, we will look at what YOU can do to protect your horse with Equine Metabolic Syndrome from developing laminitis. In subsequent segments I will describe diagnostic tools available to detect the syndrome, both in pre- and post- laminitic horses and ponies, and tackle the Pandora's Box or treating the laminitic horse with Equine Metabolic Synbdrome. I believe that education is the key to evolution. I believe that animals are the key to compassion. I believe the learning never stops.